Quality family time is important and I'll be the first to admit that it took me a little while to realize that. Growing up, I was your typical rebellious teen who thought parents were uncool, and I know I didn't make it easy on them. When I turned 18, I moved into an apartment because I felt so independent, and it wasn't until after that, that I realized how much I actually needed my parents. Now, I will say that it ended up being the best thing for my mom and I because we were constantly butting heads when we lived under the same roof. According to my dad, my little brother, and my fiance, it's apparently because we're exactly alike...which I also wouldn't admit until recently...although, my now stubborn 27 year old self still denies it most of the time! Haha! Anyway, everyone in my family lives a crazy busy life and it's not often that we get to sit and relax together unless we're celebrating some event such as a birthday or holiday. My mom and I have been trying to make more time though with movie nights. Last week, we had our monthly movie night planned, but ended up meeting my dad and brother for dinner instead and then going back to their house for drinks. 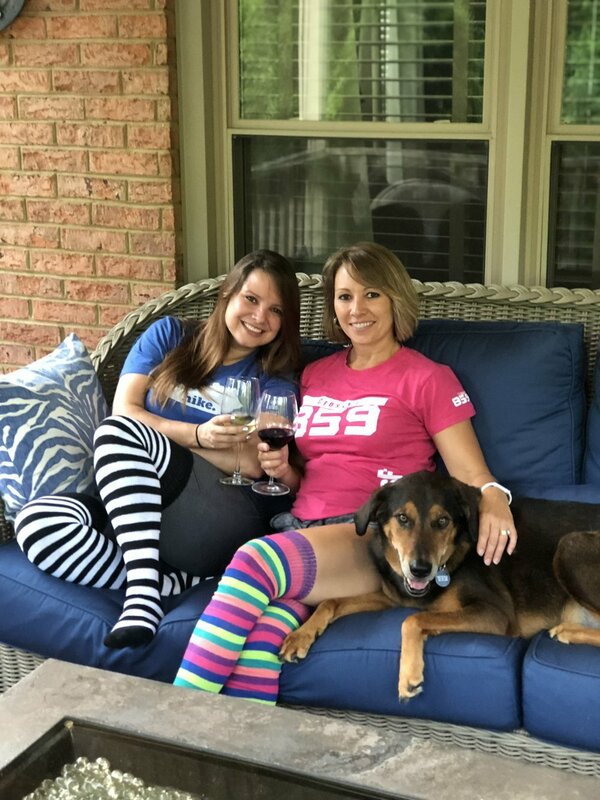 Bourbon in my hand, wine in my moms, and our new thigh-high socks by Chrissy's Knee High Socks, made for a fun evening of wedding talk. I'm still not sure if my mom and I were having more fun being photographed or if my dad had more fun taking the pictures! These socks are so comfortable and come in so many colors and designs, that I just had to share them with my mom. As my tomboy wardrobe consists of mostly black, I wore my black & white striped pair. My mom, the girly girl, of course took the fun, multi-colored pair and the solid pink pair. I do have a white pair with red and blue stripes as well that I'm pretty pumped to wear on July 4th!